Another day, another wrap. 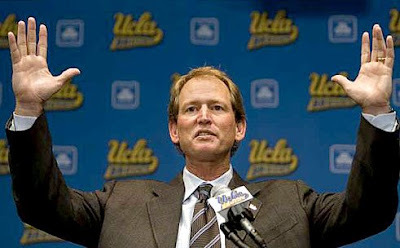 This time, a peek at UCLA and Rick Neuheisel. You remember Neuheisel, right? Golden boy goes home to Westwood, shocks the world to open his era vs. Tennessee, then everything goes downhill from there in a lost 4-8 season? The guy who was, you know, going to take back LA from Pete Carroll?? In all seriousness, it’s early. WAY too early to draw many conclusions about Neuheisel’s ability to raise UCLA from the depth’s plummeted by Karl Dorrell and company. He is going to need a few more solid recruiting classes to get some things straightened out, but without a doubt, this looks like more of a rebuild job than even Rick himself had to see coming when he took the gig last year. So, are things in fact looking up coming out of spring ball? 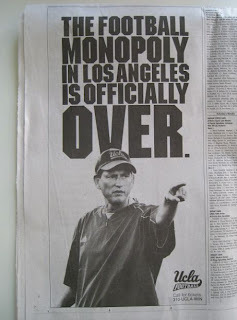 Or has UCLA’s fall in ’08 buried them in the lower-half of the PAC for another year? Read on for more…. 2008: 4-8, including a 3-6 PAC-10 record. The highlight, without question, the season opening shocker at home with the upset victory over Tennessee. The lowlight? Without a doubt, the very next week after the Tennessee highlight, which was a 59-0 embarrassment at the hands of the hated BYU Cougars. But even the 4-8 record might have been a little misleading. Outside of their win over Tennessee, the Bruins swept the Washington schools (who DIDN’T sweep the Washington schools ’08? ), and beat Stanford by a field goal. They lost the rest. So a very tough opening act for Neuheisel. FANS ARE: Eh. They understand the situation, with the lackluster performances by Karl Dorrell setting up the current administration for a lot of tough days at the office. They HATE losing to USC, but they also believe they are on the right track with Neuheisel. However, the honeymoon is clearly over. Fans want to see a much better product next season, especially offensively, or else there could be some real unhappiness in the land of tanned, beautiful people…. LAST TIME vs. WSU: A 28-3 snoozer where neither team was all that impressive. Actually, I take that back. The 28-3 loss to UCLA? Outside of the UW Apple Cup OT thriller, this game in ’08 might have been the best appearance by WSU last year. Seriously. It was 14-3 early in the third quarter after a Nico Grasu field goal, and there was some thought that a play here or there and it could get extremely interesting. But alas, the WSU offense never got much going in Marshall Lobbestael’s first-ever NCAA road start, as the young redhead went 15-for-31 for just 149 yards. Lobbestael looked nervous and unsure for most of the game, and with very little rushing attack behind him (25 carries, 26 yards), UCLA had Marshall on the run for most of the evening. OFFENSIVE SYSTEM: A multiple attack in a bit of a west coast “hybrid” under Norm Chow, a system that can utilize a lot of WR’s with various looks. They will use a tight end in an H-back mold, with a lot of motion, but can also spread you out with three-wideout-looks. 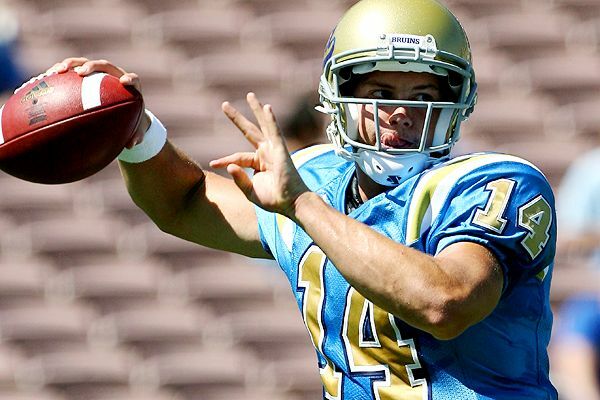 ’08 OFFENSIVE RATINGS: One of the lower-rated offenses in the conference, UCLA was #8 in the conference in points (17.7) and total offense (283.2 yards per game). Nationally it was just as bad, finishing 109th in scoring and 111th in total offense. Worse though was the running attack, where the Bruins would finish dead LAST in the conference with 82.8 yards per game, as well as a conference-low 2.6 yards per carry. UCLA did finish 6th in the conference in passing yards, at just over 200 yards per game. But they joined WSU and UW as the only PAC-10 teams to finish with single-digit TD passes in ’08 (UCLA had 9, WSU and UW tied for last with 6). ’09 RETURNING OFFENSIVE STARTERS: A whopping NINE starters are back, and they get Logan Paulsen returning at tight end from injury. Experience is a good teacher, so, they will likely be much better with so many starters back….right?? TOP OFFENSIVE PLAYER: This isn’t an easy choice, as the offense was a bit of a mess in ’08. Tight end Logan Paulsen will be back this year after missing nearly the entire ’08 season, and when healthy, he might be the best player on the UCLA offense. But Paulsen will share some time with Ryan Moya, who emerged in Paulsen’s spot last year as sort of an H-back/tight-end blend and earned 2nd team All-PAC-10 honors. So I will go with Terrence Austin, a WR/kick returning threat who has game-changing abilities. Austin led the team in catches last year, with 53, as he emerged as the most dependable wideout on the Bruins. But he also led the team in punt returns and kickoff returns. While Austin never brought one back all the way on special teams, he did average 9.5 yards per punt return, as well as a season-high 82-yard kickoff return. He also set school records for all-purpose yards in a season with 1878. Austin should have a big senior year in ’09 and will definitely be on some pre-season all-conference lists in one way or another. DEFENSIVE SCHEME: This could be a somewhat new look, as UCLA has a new coordinator in Chuck Bullough. Bullough has coached the fine UCLA linebackers the last three years, but now he gets the headset and will be making the defensive calls every Saturday. They roll with a 4-3 scheme, but they might do some things differently under Bullough. Maybe some more blitzing with his talented linebackers?? ’08 DEFENSIVE RATINGS: 8th in the conference in scoring defense (29 ppg), 8th in rushing defense (169.8 ypg), and second in passing defense (167.7 ypg). On a bit of a down note, the Bruins were 6th in the conference in pass-efficiency defense, 7th in interceptions, and 8th in sacks, with 21. ’09 RETURNING DEFENSIVE STARTERS: Seven, plus a starter from 2007 in linebacker Kyle Bosworth. TOP RETURNING DEFENSIVE PLAYER: Now this is tough, but in a good way for UCLA. There are legit all-conference players on the D-line, linebacker and in the secondary. D-tackle Brian Price was outstanding as a sophomore with 14 tackles for loss. Linebacker Reggie Carter is back for his senior year, and he led the team with 83 tackles in ’08 (including 20 tackles vs. BYU). But in the end, I’m going with maybe the best cornerback in the PAC-10 this year in Alterraun Verner. Verner had an excellent ’08 season, where he led the country in passes defended (20), and added 73 tackles, good for number two on the team. Not that you want your top cover guy to also be a tackling machine, but 73 tackles is awfully impressive no matter how you look at it. He isn’t a huge INT guy, with just eight in his first three years at UCLA, but he’s made the most of it by taking three of them back to the house. I would look for Verner to be the guy that nobody throws at in ’09. So while his INT numbers will likely be down again next season, be ready for all-everything accolades coming his way all year long. 1) WHAT’S WITH THE QB?? The most important position on the field meets the biggest question for UCLA coming out of spring. And the early reviews were that the QB’s weren’t exactly ready for prime time once spring drills were wrapped. Kevin Prince has a slight lead on some other young candidates, as they love his arm and mobility at the position. Prince looks the part at the very least – the redshirt frosh is 6-2, 226, and had a strong season of practice last year. Even in a down year, the coaches held off on burning the red-shirt in ’08. Prince still has four full seasons of eligibility. Oh yeah, Kevin Craft, last year’s starter and leading passer with over 2300 yards, is still hanging around for his senior year. But it doesn’t sound like he has much of a shot at winning the job. The staff loves Prince, and even though he didn’t run away and hide from the rest of the field in spring ball, he should be the guy to open the season. 2) OK, THAT’S GREAT ABOUT PRINCE. BUT CAN THE O-LINE KEEP HIM UPRIGHT TO EVEN HAVE A CHANCE? There’s the rub – who exactly can protect this young talent of a QB? 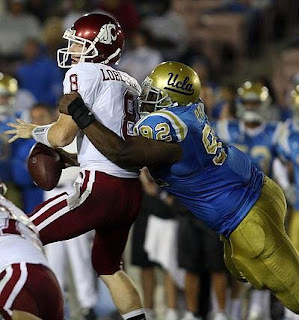 It was a long, tough season last year, as UCLA’s unproven offensive line took a whippin’ in ’08. The Bruins gave up 35 sacks, the second-most in the conference last year (WSU “led” with 43 sacks allowed). Per Ted Miller, the Bruin O-line didn’t look like they improved much at all this spring, so there is some serious trepidation that it could be a repeat performance on offense next year. Now consider breaking in a frosh QB who hasn’t yet thrown an NCAA pass with this O-line? GULP. 3) AND OF COURSE, THE SCHEDULE? UCLA’s got a tough road to respectability in ’09. They open with San Diego State in Pasadena, and that should be a game they will be favored to win. But then they go to Neyland Stadium, where 100,000+ orange-clad Vols fans will be lying in wait. This one will be a big-time revenge game for the ’08 stunner in LA. The last time a PAC-10 team went to Tennessee, it was CAL, who got whooped 35-18 in ’06. After that, the Bruins get Kansas State the following week back home in LA. But even with Tennessee in September, still, a 2-1 record looks plausible to start the year. It gets sticky in October however. The Bruins play three of their five games this month on the road. After they come off a bye on 9/26, they go to Stanford on 10/3. But then they have to face Oregon and Cal on back-to-back Saturdays, yet the good news there is that both games are in Pasadena. Then they go to Tucson and face Arizona’s tough defense, before heading to Corvallis to close out the month. 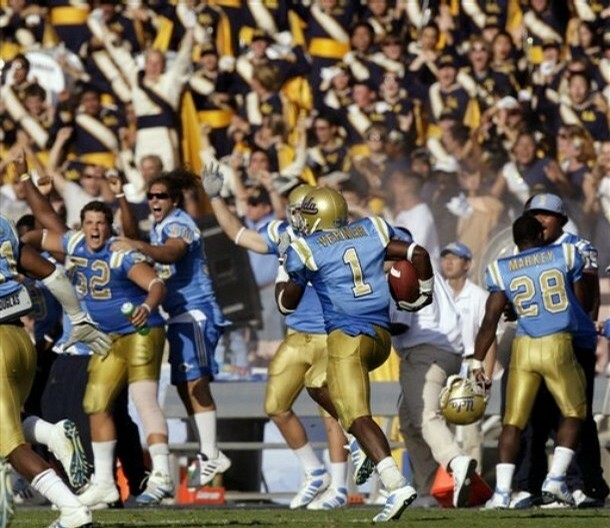 October is going to have a big say in the success or failure of UCLA in ’09. WSU FOOTBALL BLOG SEZ: Sort of like Arizona, UCLA may be in a very similar situation. They will need their experienced, talented defense to keep them in games. There is no question they have the front-line talent to do it, and they should be ready to do the heavy lifting while the offense tries to find it’s stride early in the year. What’s weird is that there were so many talented individuals last year, but they still finished in the bottom-half in the conference in so many defensive categories? A couple of theories were floated last year. One was that the defense was just stopped responding to DeWayne Walker, who eventually left to take the head coaching job at New Mexico State. And let’s face it, getting five-star talent to perform in LA? That can’t be an easy gig! Once those kinds of talents turn a deaf ear to your rants, it is only a matter of time before you either leave on your own or are shown the door by those above you. The other theory is that UCLA’s defense was strong as can be expected, but they just wore themselves out trying to overcome such a lackluster offense. I mean when the team is in the 100’s nationally in total offense and scoring offense, well, there’s only so much the defense can do to even stay in games, let alone get a bunch of victories. But given what they are returning on defense in ’09, even an average offensive showing next year could vault the Bruins into bowl contention. They come to WSU on 11/14, and that’s another weird deal. UCLA has had issues playing in Pullman over the years. But it’s not just Pullman. Overall the Cougs are 5-2 in their last seven against the Bruins. The last time UCLA came to Pullman, the Cougars were struggling while the Bruins were hot, sporting a 5-2 record and fresh off an upset win over Cal. But WSU prevailed 27-7 in a game where UCLA never seemed to even want to get off the bus, let alone actually play a college football game. I was in the stands that day, and without a doubt it was one of the flattest efforts I have ever seen from a WSU opponent. But let’s face it, the Bruins hate to make that trip to Pullman, and they don’t exactly hide their disdain for the Palouse. Get them up in Pullman in mid-November, well, who knows what we’ll see from UCLA. But overall on UCLA, it’s all about the QB and O-line play. If they are even average, they have a shot at a bowl. Otherwise it’s another year in the bottom-third of the conference. That’s about it for today. ENJOY YOUR TUESDAY, and as always, GO COUGS! You are currently browsing the archives for the Brian Price category.